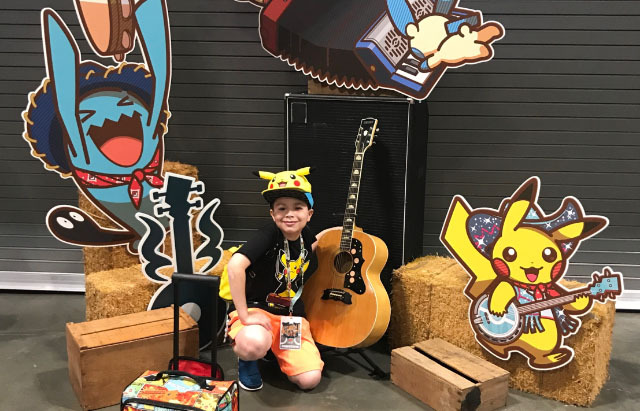 Alex Garcia may only be 15, but he is already making a name for himself in the Pokemon community, not just for his growing talent but his friendly personality. With the goal of playing in Worlds, Garcia has traveled around the United States to play in League Cups and Regional Championships. He’s often in Top 8 or Top 4 in his cups. While he didn’t place in Dallas, he had a blast meeting new people and making some awesome trades. 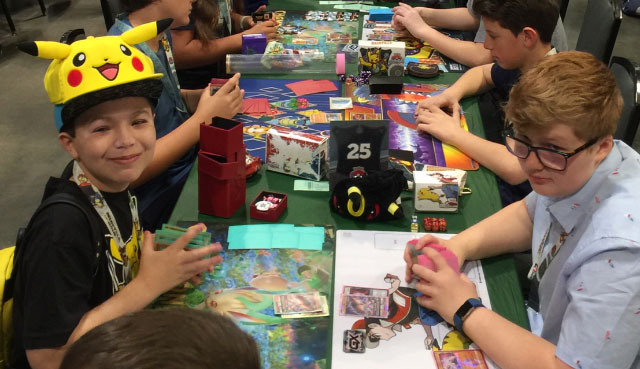 I spoke with this enthusiastic TCG player about his passion for Pokemon, and got some advice for people with their eyes on Collinsville at the end of February. If you see him at a regional, definitely say hello! You just got done with your coaching session with Pablo Meza. How did that go? It was actually pretty fun. I was trying out Primal Groudon. I don’t know how I feel about it. If you don’t start well with it, it feels kind of bad. And I mean really bad. But it’s an interesting deck. I actually like Plasma Snorlax in it, which doesn’t allow your opponent to retreat when it’s active. It’s really nasty, but I like it, especially with Target Whistle. That’s a fun combo. How long have you been having Pablo coach you? Almost a year now, I started in late March. I thought that he was a good player. I had met him in Costa Mesa and then he met up with me in Charlotte. I saw him in Portland, making top 16 with Sylveon mill. I asked him if he could coach me and he said sure. That’s awesome. Do you feel it’s made you improve? It definitely has. I can tell you this right now, my one accomplishment as a senior, I feel I don’t deserve it. It was at the Dallas Regional last year. I went first in about every mirror match. But I remember all the misplays I made. One time against Wailord, his Xurkitree wasn’t even in the active and I activated my Alolan Muk. I remember those things and they haunt me! But at least you’re learning from those moments. I definitely feel I have improved. I have a good practicing partner, which is nice because most of the people I play with in New York are over 40 minutes away. That’s not exactly close. PTCGO* is great, don’t get me wrong. It’s a great resource. But I feel like playing in real life is usually better. You get a better feel for the cards. What is your goal this year for Pokemon? My goal this year is to make Worlds and to win a regional. I am really trying to make it to Day 2 and possibly win a tournament. Top cutting would be great, but winning would be my dream. I’m at 277 points. This quarter hasn’t been kind to me. In my past Standard cups, I have been dead drawing. In standard, a lot of my games, whether it’s me or my opponent, have come down to dead draws. At one recent cup I was playing Malamar against Zoro-Weavile, and I would have placed, but I lost because of a Let Loose. After that, on my turn, I said, “Pass.” Then it was my turn again. I drew a card. Then I passed. The next turn, I draw and pass. That happens a lot in standard. What is the next regional you’re planning to go to? The next upcoming one will be Collinsville. I’m 100% going. I’m not sure about the Canadian regional, because I don’t have a passport. And with the government shut down, I’m not sure how it will work out. But I will try because I have a friend in Canada. Plus it’s Expanded. I prefer Expanded right now because the decks feel smoother. I may whiff a card or two, but it was never a draw pass or clunky situation. I have lost games from being N’d, an opponent coming back from 6-1. Standard is missing that right now. Yeah, a lot of times the games are already decided. How did you do in Dallas? That was Expanded. Dallas I went 3-3-3. I tied with Trevenant. It was just long. I scooped game two pretty quickly. But it was taking a while. Game three I would have won, but time was called. If you didn’t get enough points to play at Worlds, would you still go? Yeah, I’d definitely go to Worlds. The open is pretty fun. I do just like meeting people there and want to get some cool trades as well. Trading is always fun, like Japanese memorabilia. I did that last year at Worlds. Just being able to make new friends. I made a friend from Russia last year. It was so cool! I never thought I’d make friends with someone from so far away. That’s awesome! Why do you enjoy the Pokemon TCG? I love Pokemon because it’s Pokemon. I’ve always played Pokemon. I’ve always collected the cards, but one day I wasn’t feeling good. Dad took me to a local card shop. They were having a pre-release. He said I should go. I said, “Sure!” I brought some cards, made some trades, opened up packs, learned how to play the game… It was fairly easy for me to understand. I started going there weekly to play with my friends. I decided I wanted to make a real deck. I played it very badly, but I played Steam Siege Mega Gardy. I think I only played one Super Rod. It just wasn’t a good list. How do you like the community surrounding the TCG? The Pokemon community have been really cool. Most people I meet are really cool. Whether it be kids in the senors division, or masters. A lot of times they’re really nice, too. The tournament organizers are nice, and the judges. You recently went from the Senior Division to the Masters Division. Were you nervous? It seemed a bit scary at first. I went to my first League Cup and thought, “This might be a bit hard.” But I actually got top 4. The next day I made it to the finals of a cup. It felt pretty good, I have to say. I lost to Buzzwole both times, even though I added a tech for it. It came in clutch in Top 8, but in the finals the next day I played against BuzzRoc/Magcargo and it didn’t go well, especially when I prized it game one. What do you like about the TCG? There’s always something different in every game. I can never tell what’s going to happen. Some people say, “What do I do with this deck against this deck?” But I can only give a general idea. I’ll tell someone, “I can’t tell you 100% what to do. It all depends on your prize cards, what’s in your hand.” There’s so much variance. Plus I love the designs of the Pokemon cards really. What are some of your favorite Pokemon cards? Some of my favorite cards, I’ve always liked Gardy for how powerful it is. It’s a fun card. In terms of trainer cards, I have always liked Delinquent. That’s a fun card. Collecting-wise, I love Bulbasaur and Venasaur. I love Pikachu. And I love the Eeveelutions. I’m always looking for those guys. I actually just got a 1st edition shadowless Venusaur, a rainbow rare Charizard, and an Evolutions pre-release Charizard signed by the artist himself. I got him to sign it in Dallas last year. Wow, that’s awesome. You said you were always into Pokemon, even before the TCG. What got you so into it? The characters. They’re so appealing. They’re so nice. Pikachu is a very warm Pokemon in my opinion. You can go up to him and give him a big hug. I could do that right now! But there’s always something interesting about their powers. No Pokemon is the same. You can train them, but one will be more defensive. One will be more attack based. That’s the same for the decks. You can make a stall Wailord, or an attacking Wailord deck. That’s what’s super fun about Pokemon. They’re personalized. They have their own strengths and weaknesses, but own personality. It’s like having a pet. When I was younger I had the Poke Walker and I loved that. It was like walking around with it. Do you have any advice for people practicing for Collinsville? For Collinsville, make sure you practice some general matchups. Don’t go for something you don’t feel comfortable with. There are so many decks – Pikachu & Zekrom GX, Zapdos. Make sure you’re using the cool new tech cards. Mimikyu & Gengar GX in Malamar could be fun, but make sure it still flows right. Don’t cram it in just to cram it in. You want to flow well. What is your favorite Tag Team? I really do like Eevee & Snorlax GX. I think it will be a great fit in my personal favorite deck, Malamar. For practice, always do a little bit of peaking around at League Cups. It’s never the same meta. Always look at what people are playing to get a general idea. For a regional, definitely check LimitlessTCG for the latest deck lists. Look at what is doing well lately. Then I make my own list based on a winning list, making some personal changes. With a new set coming out, definitely check out the latest results from the next International Championship. But always stick with what you’re comfortable with. If you’ve practiced a lot with a deck and know it can handle a lot of the new decks, go for it! When you’re not playing Pokemon, what do you like to do? I do like to play Smash. Right now I main Pichu. I think he’s pretty good. He’s fast. And I love building LEGOs. I have some really big sets. I built the giant Death Star. I built the 4,000 piece Ghost Busters firehouse. I had the pleasure of playing against Alex in round 8 of Denver this past weekend. It’s a shame we weren’t able to ID into day 2, but we had a great series that was a lot of fun despite the fact that we were basically in a “win-and-in” situation. Look forward to seeing him again at future tournaments!